Castano is the producer. Monastrell is the variety, but don’t be frightened because you probably know it better as Mourvedre or Mataro. Bodegas Castano is the biggest producer in a region known as Yecla in the south-east of Spain, a little west of Alicante. Monastrell is the major variety in Yecla. Although it can vary between regions and climates, Monastrell has a reputation for colour, tannin and alcohol. Picture painted, on with the notes. Starting to brown a little around the edges but otherwise a dense purple/black. The nose leads with rich, ripe, sweetish raisiny blackcurrant and a liberal dose of redfruits. There’s a touch of aged leatheriness and some spicy vanillan licorice, a whiff of cardamom/cumin, and on the savoury side some char and tar and black olive. There’s gorgeous red berried ripeness and choc-cherry mocha. The oak is very subtle, savoury and stylish. The age is showing more obviously on the palate with raisiny coffee choc, molasses, orange rind and raspberry coulis. There’s some satisfying black tea bitterness – tannins probably – I’m not complaining. And some smoky, gamey flavours to promote the savoury elements. But how’s that mouthfeel? Smooth as a baby’s back-end. Supple. Texturally lush. Probably the alcohol – it is 14.5% after all. 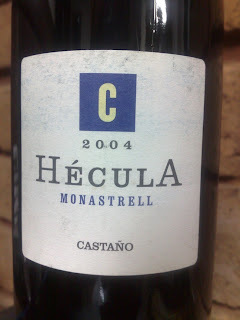 The Hecula Monastrell spends 6 months in French oak. Gee I enjoyed this. It’s getting on a bit in life but it’s still a really good brew, especially with good company and a few home-cooked pizzas – casual style. Everyone loved the texture and blend of sweet/savoury. You could call it a quaffer, and it probably qualifies for that at approx $25, but it’s a bit more special than that. Value: Approx $25 in Australia – very good value for a decent import of this quality. Producer: Bodegas Castano – www.bodegascastano.com – the largest producer in Yecla, Spain, with 450Ha of vines. A family affair. Site: The vineyard source for this wine is 750m altitude and include 35 year old bush-vines. A combo of dry sandy stone and limey clay. Vintage: Exceptional for the most part. Warm, dry conditions – generally rain and disease-free.